Get some historical perspective at Santa Monica Pier and El Pueblo de Los Angeles. We've included these beaches for you: Venice Beach and Boardwalk and Will Rogers State Beach. Get out of town with these interesting Los Angeles side-trips: Anaheim (Disneyland Park & Disney California Adventure Park) and Santa Monica Yacht Harbor Sign (in Santa Monica). Pack the 9th (Wed) with family-friendly diversions at Universal Studios Hollywood. There's still lots to do: kick back and relax at Santa Monica State Beach, see the interesting displays at The Getty Center, get a new perspective on nature at La Brea Tar Pits and Museum, and appreciate the extensive heritage of Venice Canals Walkway. To find more things to do, photos, ratings, and more tourist information, go to the Los Angeles online route planner . If you are flying in from Australia, the closest major airports are Los Angeles International Airport, John Wayne Airport-Orange County Airport, Ontario International Airport and San Bernardino International Airport. September in Los Angeles sees daily highs of 34°C and lows of 22°C at night. Cap off your sightseeing on the 14th (Mon) early enough to go by car to Grand Canyon National Park. Start off your visit on the 15th (Tue): take some stellar pictures from Mather Point, then tour the pleasant surroundings at South Kaibab Trail, then explore the stunning scenery at Grand Canyon South Rim, and finally explore the stunning scenery at Yavapai Point. On your second day here, take some stellar pictures from Hopi Point and then hike along Rim Trail. To find maps, traveler tips, photos, and other tourist information, refer to the Grand Canyon National Park trip itinerary builder site . You can drive from Los Angeles to Grand Canyon National Park in 7.5 hours. Alternatively, you can do a combination of flight and bus; or do a combination of flight and shuttle. Due to the time zone difference, you'll lose 1 hour traveling from Los Angeles to Grand Canyon National Park. Traveling from Los Angeles in September, you will find days in Grand Canyon National Park are a bit cooler (28°C), and nights are cooler (7°C). 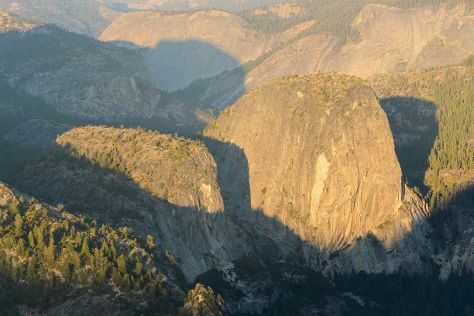 Cap off your sightseeing on the 17th (Thu) early enough to travel to Yosemite National Park. Kick off your visit on the 18th (Fri): take in the awesome beauty at Cathedral Beach Picnic Area, take in the dramatic scenery at Vernal Fall, then explore the striking landscape at Sentinel Dome, and finally explore the striking landscape at Glacier Point. Here are some ideas for day two: tour the pleasant surroundings at Tuolumne Meadows. To find ratings, more things to do, traveler tips, and other tourist information, use the Yosemite National Park road trip planner. You can do a combination of bus and flight from Grand Canyon National Park to Yosemite National Park in 13 hours. Other options are to do a combination of shuttle and bus; or take a bus. Traveling from Grand Canyon National Park to Yosemite National Park, you'll gain 1 hour due to the time zone difference. Traveling from Grand Canyon National Park in September, you can expect nighttime temperatures to be slightly colder in Yosemite National Park, with lows of 3°C. Wrap up your sightseeing on the 19th (Sat) to allow time to drive back home.